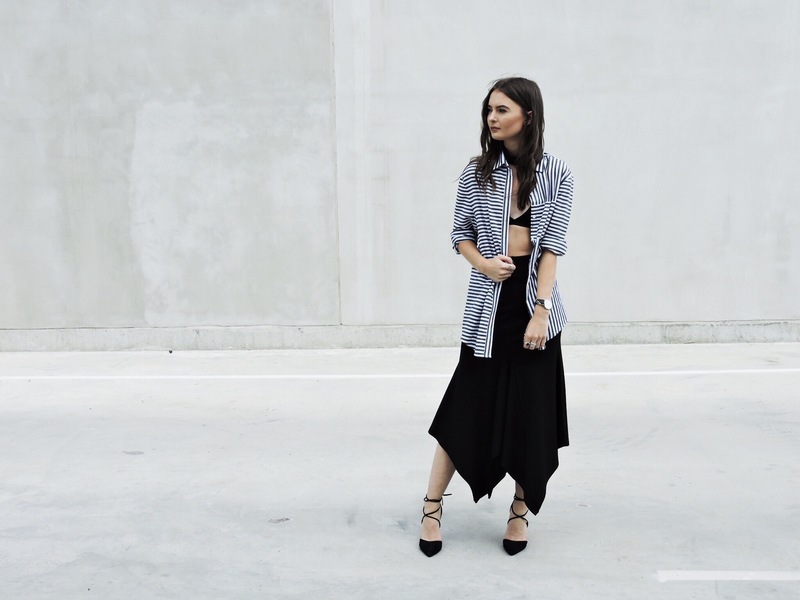 BRALETTE: Cotton On // SHIRT: The Fifth Label // SKIRT: The Fifth Label // SHOES: Skin Shoes – dropping in a few weeks! I didn’t intend to look witchy with this outfit as it’s so wicked but I feel like I could certainly use this skirt for a dress-up party and nail the wicked witch of the west look.. haha!! Anyway, I wanted to share these two together as I really struggle with stripes sometimes and I couldn’t believe that I found a striped oversized shirt that I actually liked. Finding the right oversized look is always a struggle so it’s important to pair an oversized shirt with something very slimming on the bottom whether that be a pair of skinny jeans or a slimming skirt like the one above. This shirt is great worn open with a little bralette and skirt, or buttoned up with skinny jeans and a cap to get the baseball look. What are your thoughts on the oversized look? Haha! This title alone was captivating. I loved this post! This outfit is super cute! I love everything, especially your shoes! I love your outfit. It´s effortless, cool and chic. Great!